Having just read Parshas Vayigash this Shabbos, there are quite a few hints in this Parsha to Saba and the Petek. As we can see, Parshas Vayigash, the 11th Parsha of the Torah, is highlighted with Yosef, the 11th of the 12 Tribes, revealing himself to his brothers who didn't recognize him after a 22 year separation. Accordingly, after several days of depression from the morning of 17 Tammuz, the Petek is revealed to Saba. This Petek consists of 11 lines. It begins with the word Me'od (very much). And indeed, the very last word of this 11th Parsha of the Torah is Me'od! But it isn't just the last word of the Parsha that is related to the Petek, it is the last Posuk of this Parsha. You see, this Parsha consists of 106 verses, and Saba passed away in his 106th year. Now, what is this 106th and final Posuk of Parshas Vayigash? "Yisroel lived in the land of Egypt, in the land of Goshen, and they took possession of it, and they were fruitful, and they multiplied very much". Indeed, Saba's first name is Yisroel. This is aside from the fact that there are 11 words to this Posuk. But here is a question. Does Yisroel in this Posuk refer to Ya'akov, or to his children/descendants? You see, usually when the Torah refers to the Jews, they are referred to as B'nei Yisroel, even as early as the Gid HaNoshe incident with Ya'akov. But here, it doesn't seem to make much sense that Yisroel refers to Ya'akov per se, since the verse continues speaking in the plural form. But this is how the verse goes - "Yisroel lived", which is in the singular form as Vayeishev rather than Vayeishvu, and then it continues "THEY took possession of it, THEY were fruitful, THEY multiplied". So, why is the Posuk worded as such beginning with the singular form and ending with the plural form, unless Yisroel does refer to Ya'akov which would still raise a question as to why the verse changes from him to his children if they were all at the same place. You would think that Rashi, the prime Peirush on the Torah who is most concerned about the simple meaning of the verse, would be bothered by the way that this Posuk is worded, but he seems to be more concerned to note that Goshen is part of Mitzrayim. So, no doubt then, that there is a very good reason why the Posuk begins saying the word Yisroel, rather than B'nei Yisroel, and in the singular form. Hence, this is even more proof that this is hinting especially to Saba - Rabbi Yisroel Odesser, who passed away in his 106th year, being hinted in this 106th and last Posuk of the 11th Parsha that consists of 11 words, and ends with the word Me'od, the very first word of the 11 line Petek! Moreover, as the Posuk speaks of Yisroel living in Mitzrayim, the revelation of the Petek took place during the Bein HaMetzarim; the letters of the word Metzarim being spelled exactly as the word Mitzrayim, and the 17th of Tammuz, the beginning of this period, is the very date that is mentioned in the 11th and last line of the Petek! Now, it gets more interesting. You see, in the Sefer Torah, there are either three or nine letter spaces between one Parsha and the next. However, there is only one place in the entire Sefer Torah where there is only one letter spacing between one Parsha and the next. You guessed it - there is only one letter spacing between Parshas Vayigash and Parshas Vayech - the 12th Parsha, noting that the Gematria of Saba's second name Dov is 12 (which is supposed to be spelled with a Vav in the middle). And what is the beginning verse of Parshas Vayechi? It mentions Ya'akov's 17 years in Mitzrayim and his 147 years of life. As related to 17 Tammuz - the beginning of the Bein HaMeitzarim period, aside from Ya'akov's 17 years in Mitzrayim, this first verse of this new Parsha which is most close to the previous Parsha that hints to Saba and the Petek - consists of 17 words! As for Ya'akov's 147 years, we see a parallel in Maseches Sofrim which notes that parallel to these years are the 147 Psalms of Tehillim. But wait a minute! We see 150 Psalms in virtually every existent Tehillim. The answer is that at one time, it was indeed 147 Psalms, but became divided differently over time to be 150 Psalms today. But the reason that I mention this is because the seventh line of the Petek - Na Nach Nachma Nachman Meuman - the Gematria is...well, that depends on how we read the word Me'uman. You see, the letter Aleph in this word looks a little different than the other Alephs in the Petek, because the letter Vav looks like it is part of the letter Aleph, and hence, unlike the usual spelling of word Uman which would make the Gematria of this line 491, the word Me'uman without the Vav would make the Gematria of this line 485, and in fact, this is the very Gematria of the word Tehillim! And as I heard from a Nanach, noting this phenomenon, the Gematria of the word Sefer and Shem (name) is the same - 340, and hence, the Gematriot of Sefer Tehillim and Shem (name of) Na Nach Nachma Nachman Meuman are the very same! Indeed, the powers of mentioning the name of the Tzadik are like the powers of saying Sefer Tehillim, and that is the ultimate purpose of the Sefer Shemos HaTzadkim. Now, having mentioned that the SEVENTH line of the Petek is the Gematria of the word Tehillim, dividing the number 147 - the original amount of psalms of Tehillim - by SEVEN, yields 21, and there are 21 days of Bein HaMeitzarim until Tisha B'Av. And as for including Tisha B'Av as the last of the 22 days of this saddest period in the Jewish calendar, Ya'akov was the 22th generation from Adam & Chava, and the Mitzva of Gid HaNoshe, which resulted from Ya'akov's thigh being injured by Esav's angel, represents the day of Tisha B'Av, the 22nd and final day of this sad period. And then, just as Ya'akov was away from his parents for 22 years (aside from 14 years of Torah study), he was similarly separated from Yosef his 11th son, for 22 years. In fact, the first two years of famine during which the Tribes came to Mitzarayim, the last of the 22 year separation of Ya'akov and Yosef, correspond to Erev Tisha B'Av and Tisha B'Av. And it is only at the conclusion of this 22 year period, at the end of the year corresponding to Tisha B'Av, that Yosef reveals himself to his brothers. In contrast, the revelation of the Petek to Saba didn't happen at the end of the Bein HaMetzarim period, but rather, at the end of the SEVENTH day from 17 Tammuz, and this is noting that the name of the Tzadik - Na Nach Nachma Nachman Meuman is in the SEVENTH line of the Petek. And using the number SEVEN, it ends both the numbers 17 and 147, the numbers used in reference to Ya'akov in Mitzarayim and the years of his life, respectively. Similarly, the END of the SEVENTH day of the week, the end of Shabbos, is the holiest part of Shabbos - Ra'ava D'Ra'avin. 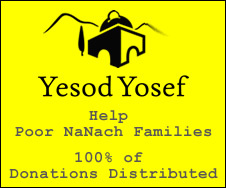 Among other Tzadikim, it marks the timing of the week of the passing of Yosef, the 11th son of Ya'akov, whose passing is mentioned in the last Posuk of Parshas Vayechi/Sefer Bereishis. And as we see in the Torah, Yosef is especially noted for his honoring the Shabbos, as hinted to where it says in the Torah about ordering a meal being made for him and his brothers when they visited him the second time in Mitzrayim. May the merit of Na Nach Nachma Nachman Me'Uman help speed our redemption from exile very soon!